As it been a week already? We're approaching our counter party in the U.S for their Thanks Giving weekend as well as "Black Friday". 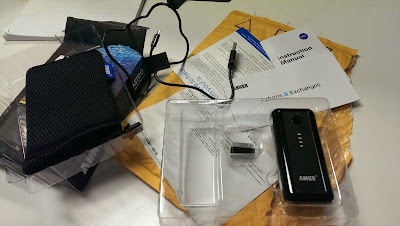 With that in mind I'm going to review a previous Gen Anker Astro 5600mah! This is the perfect time to start thinking about what tech gadgets you could put your hands on! The Anker Astro 5600mah is a generation behind the current models available by Anker on Amazon.ca. This current model is a slick one, small, compact, efficient but it does take 5-6 hours to actually charge it up from empty. My real world experience with it is simple. Don't carry chargers with you, plugins or anything like that. Simply the portable battery charger and the micro usb cable. I can easily tuck this away in my jacket, pockets etc. I started with a fully charged HTC One and a Galaxy S4. I wanted to test charging these two devices. Mind you this isn't it's limit, you can charge anything you'd like as long as it supported/work. Usually my HTC One will give me approximately a good 15 hrs of battery usage. I was able to just plug it in get it charged from 15% to 100% in about 3 hours. I keep working through my days, go out with friends, restaurant etc. The phone needs to get charged again 15 hrs later, 3 hrs to charge done. If we recap this. 15 hrs current charge usage, 3 hrs to charge, 15 hrs usage, 3 hrs to charge and 15 hrs usage again. We're well over 48 hrs of usage on 2 charges without the usage of a power outlet. I think that's pretty good if you ask me. The other test I ran was with charging a Tablet that has a 4000mah. Now usually I don't need to charge the tablet everyday I can usually go 2 or 4 days before I have to charge it and yes I do use it quite frequently. It charged the tablet up quicker then it did for the phone. About 3 hours 30 minutes was required to charge the tablet from 20%. One of thing I did notice with the unit that I bought is that it does a humming noise only when it's not connected to your device correctly. So just be sure you actually plug everything in as it should. In my personal view on the subject of portable external battery charger, I think it's a must now a days. Quite frequently I find myself away from an actual power outlet and I need the juice. The Anker Astro 5600mah was a great buy but at 40$ I think it might have been a bit expensive as you can get other models that they have for 10$ more that include 15 000mah.